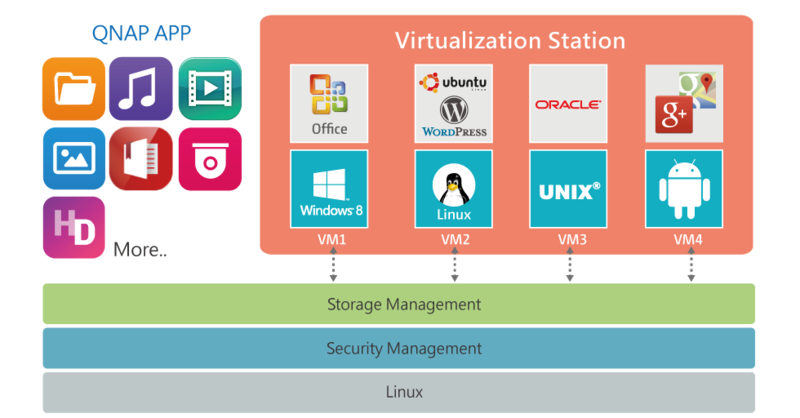 Virtualization is a core part of modern IT infrastructures. QNAP NAS can be used to provide a perfect backup solution for ensuring that virtual machines are maintained and have well-protected backup facilities. With the constantly-rising computational power of even consumer hardware, virtualization is no-longer exclusively a high-end business application. Now every company and organization no matter the size can greatly benefit from the seemingly infinite applications of virtualized environments. But without the right backup facilities, these applications could potentially come crashing down and with it cause sizable disruption to essential applications and services. With potentially huge storage capacities, high performance, integrated virtualization solutions and support for popular third-party virtualization solutions, QNAP NAS are perfect for backing up virtual machines. QNAP NAS provides RAID protection to safeguard backup data from possible hard drive failures, AES-256 volume-based encryption can secure confidential data, and remote replication provides further backup solutions. QNAP NAS are also easy to use, can provide instant notifications to administration staff, and feature low power consumption to help keep utility costs down. 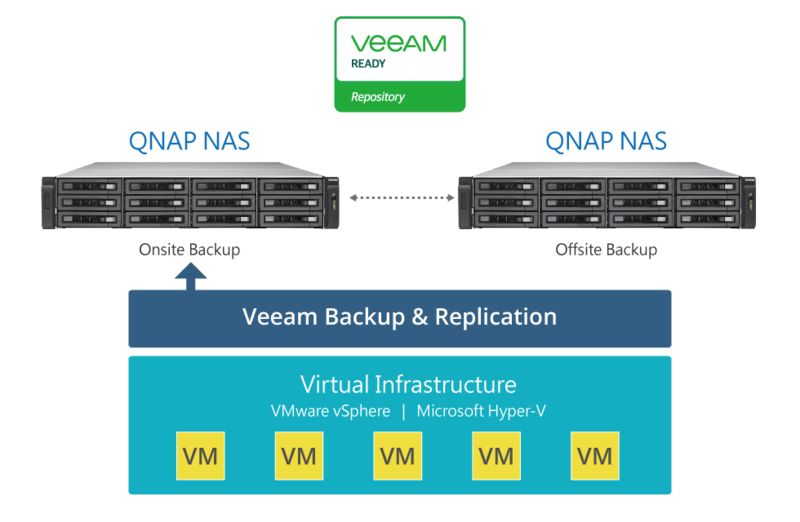 Veeam® Backup & Replication™ software with QNAP NAS provides a cost-effective backup solution for VMware® and Hyper-V® that maximizes data reduction and scales to meet the needs of demanding enterprise environments. This affordable and complete backup solution allows setting up one or multiple QNAP NAS units as the backup storage, replicating VMs and backing them up to a remote site for an efficient disaster recovery solution. When running virtual machines using QNAP Virtualization Station, their status can be easily saved and reverted to if necessary by using snapshots. Virtual machines can also be imported and exported easily for further use.